Here is the report from our visit to one of the producers to observe the process of “Mojie Ringo” apples. 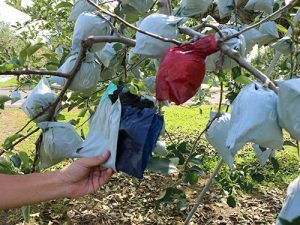 The apples that are bagged during cultivation are used for “Mojie Ringo.” Bagging apples enables farmers to block direct sunlight. Exposing the fruit to sunlight after a certain time immediately encourages them to produce anthocyanin, a component that turns the skin red. Areas covered with a seal will be left non-red, so letters and designs will appear clearly on the skin. For information on the coloring of apples, click here. Mojie Ringo apples are cultivated in the same method as normal ones, except for the final procedure: seals are applied on the surface of the apple after it is unbagged, and they are removed after the harvest, just before boxing. In order to promote the coloring of apples, the work of pruning leaves is indispensable. 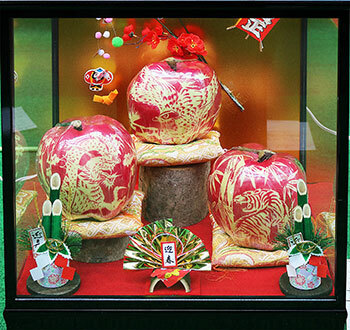 Large apple varieties like “Mutsu” or “Stark Jumbo” are used for Mojie Ringo, with designs of good luck charms and Christmas-related items, etc. 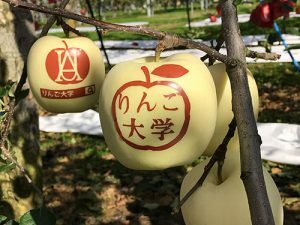 Since the “Mutsu” apple variety has yellow skin from the beginning, triple-layered bags are used for a higher light shielding in order to color them red. First, the outer two bags are removed. 4 or 5 days later, when the last bag is removed, the seal is applied. The material of the seal is a plastic sheeting, the same as the one used for cars and advertising boards. 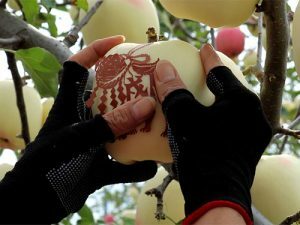 Because the apples still grow after applying the seals, its elasticity helps the seal to remain right on the surface and maintain a sharp outline for the design. It only takes a few seconds to attach a simple letter, but the finely drawn designs require a pair of tweezers to apply the seal. Because of the uneven surface of the fruit, seals tend to become distorted. The workers were using a pair of scissors to cut off the extra material in order to fit it perfectly. Here is a “Stark Jumbo” apple. Some fruit weigh more than 1000g, and it is bigger than a “Sekai Ichi”, or the World No. 1. apple. The average “Fuji” weighs 300~400g, so Stark Jumbo is about 3 times as heavy. Because of the weight, a single fruit dropping off the branch causes other fruit on the tree to fall as well. 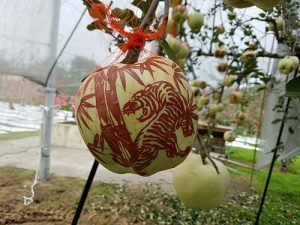 So, the risky fruit is covered with a net pouch to keep it firmly affixed on the branch. Using a big surface, designs can be larger and more complicated. We found some apples with their entire surface covered with patterns. In the next article, No. 2 [Coloring ~ Finishing], we’d like to report on the process of coloring.